In dozens of conversations, Japanese Prime Minister Shinzo Abe has counseled President Donald Trump to avoid making concessions to North Korea that could upset East Asia's balance of power, including a military retreat from South Korea that would leave Tokyo alone on the front lines against China's growing power. "The big picture is that any withdrawal of U.S. forces from the peninsula would benefit China," said a source from Prime Minister Shinzo Abe’s policy circle. "In 10 years, the U.S. could be out of Korea and Taiwan could be like Hong Kong," he added, asking not to be identified because he was not authorized to speak to the media. Any outcome from Trump's meeting with North Korea's Kim Jong Un in Singapore on Tuesday that makes that scenario more likely may force Japan to accelerate preparations to survive without U.S. military power, sources familiar with the nation's security planning told Reuters. Already, Japan has reinforced islands along the edge of the East China Sea, sought new regional allies, such as Australia and India, to balance China's power and, more recently, made a diplomatic push to reduce tensions with Beijing. U.S. Secretary of State Mike Pompeo on Thursday restated that Washington wants "complete, verifiable and irreversible" denuclearization of the Korean Peninsula. But he added that the U.S. would work to guarantee Pyongyang's security if it abandoned a nuclear arsenal it says it built to deter U.S. aggression. The United States has 28,500 troops in South Korea, a legacy of the Korean War. Japan hosts 50,000 U.S. military personnel, including the biggest overseas concentration of U.S. Marines, and an aircraft carrier strike group. "Any reduction in US force levels in Northeast Asia will be seen as a relative retreat by the US. This is one of China's key strategic objectives," said a former senior U.S. military commander in Asia. With no U.S. forces in Korea, "the US-Japan alliance really stands alone in Northeast Asia." Japanese leaders see the same dynamic unfolding, and it has been a key part of Abe's message to the White House. "A U.S. military pull out from the Korean peninsula would create a power vacuum. The Pentagon understands this and Japan is also saying this to Trump," a senior Japanese defence ministry official said. China says its intentions are peaceful and rejects any suggestion it harbors territorial ambitions in Asia. Japan, nonetheless, fears China's growing strength. Its military is fed by annual defense spending increases that Tokyo, hemmed in by welfare spending to support a rapidly aging population, is unable to match. Japan's military outlays have grown for the past six years, and a policy paper discussed by ruling Liberal Democratic Party lawmakers in May proposed Japan adopt a North Atlantic Treaty Organization-style commitment to spending 2 percent of GDP on defense. Even at that level, however, Japan's military budget would still only be about half of what China plans to spend in 2018. "Unlike the 1930s, Japan cannot militarize and neither can it go nuclear. Japan has no option but to strengthen diplomacy," said the source from Abe's policy circle. "Abe is a realist." Abe's diplomacy push included a meeting last month in Tokyo with Chinese Premier Li Keqiang, the first such visit to Japan since 2010. The two agreed to establish a security hotline to help defuse unexpected incidents. Throughout, Abe has stuck close to Trump to keep him committed to pressing Kim on denuclearization. Abe met Trump in Washington on Thursday, the 31st time the two leaders have spoken since Trump took office, more than twice as often as he talked with President Barack Obama during the whole of his second term. "In the last 18 months, we really spent many hours to discuss this issue. We shall never repeat the past mistakes," Abe said at a joint briefing with Trump following their latest tete-a-tete. Abe said sanctions on Pyongyang should not ease until it agrees to complete, verifiable and irreversible denuclearization. Tokyo has also demanded that Kim reveal the fate of Japanese citizens abducted by North Korea to train its spies. Japan will hold back economic assistance to North Korea, Abe has said, until all those issues are resolved. Trump, who has suggested he wants to drop the term "maximum pressure," has focused more on trade. "The Prime Minister and I have been working to expand our cooperation in a range of areas, including defense and commerce, which is what we discussed today," he said. The Japanese public is more pessimistic than their U.S. counterparts about the prospects of the summit, according to a survey conducted in May and June by Japanese think tank Genron and the University of Maryland. They gathered 1,000 responses in Japan and 1,215 in the United States. Only 6.2 percent of Japanese respondents agreed that the talks would deliver significant progress on denuclearization, compared with 21.8 percent of Americans in the survey. 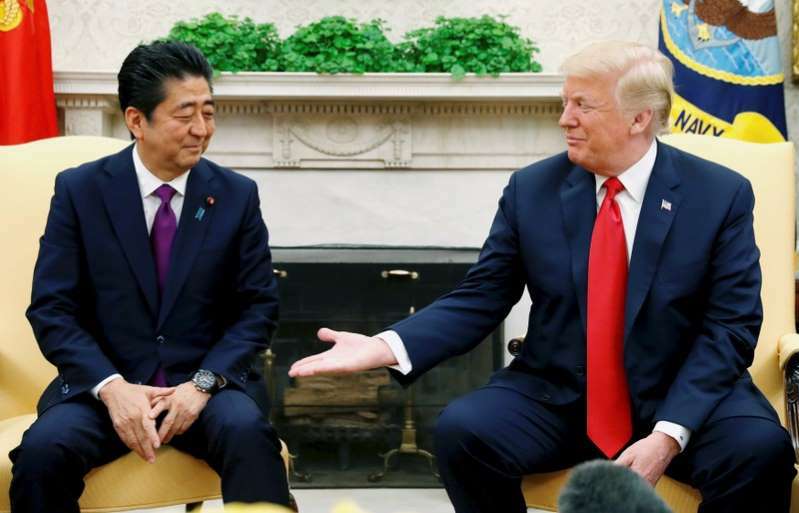 Whatever the outcome of Trump's meeting with Kim on Tuesday, Abe will support Japan's U.S. ally, said Takahashi Kawakami, a professor at Tokyo's Takushoku University. "Abe can argue that denuclearization talks will take more time," said Kawakami. "It's unlikely to hurt his public approval at home, and it will give Trump a bump."